Aza Ray Boyle has been dying since she was born. It's some sort of lung condition so rare that it's actually named after her, because she is the only person who has it. She has spent the entirety of her life in and out of hospitals, taking medication, being stuck with needles, etc. What makes it bearable is her loving family and her best friend Jason, who is just as smart and weird as she is. In the week before her sixteenth birthday, she starts hallucinating a ship sailing through the storm clouds. She wakes up with a feather in her lungs. She hears distant voices calling for her. "Magonia," Jason tells her. Her hallucination reminds him of things he's read, about a mythical land existing in the skies, sailing here and there, masked by the clouds. And after she finally passes away, five days before her birthday (not a spoiler), Jason is the one who spots the ship in the sky above her funeral. 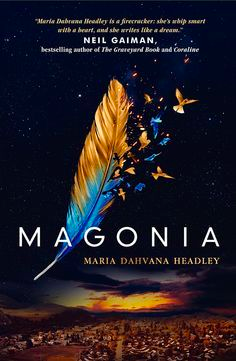 Meanwhile, Jason, who swears he heard Aza calling his name that day at her funeral, is doing everything he can to research Magonia and to see if he can track down his friend, the girl he loves, who he swears is still alive. So... wow. This is probably one of the most original stories I've read in a while. It's the second book I've read recently that has bird people in it (The Girl at Midnight being the other), but its mythology is completely mind-blowing, and is of course, based on some real legends. Magonia seems to be rather meticulously researched, which I totally appreciate - from the legends of floating cities themselves down to every random fact that Aza and Jason discuss, I was super impressed by all of it. There are emotional parts, but it's not maudlin. It's not overwrought. It's as much a story of high-seas adventures as it is a story about illness (maybe even more so), with a dash of environmentalism thrown in. I also feel like it would make a great movie, considering the story's emphasis on the visual (the outward appearance of the Magonians) and the aural (the bird songs). This book is well-deserving of the hype, and I can't wait for the sequel to come out next year.